Three compartments, each about 1 1/2¬ (3.81 cm) deep, keep food separated. The two smaller sections hold up to 6.75 oz. (200 ml), while the larger one has a 12.6 oz. (375 ml) capacity. The high walls of each compartment can be used to help push food onto forks and spoons. Stackable with clear plastic covers for easier transporting and storing of food. Diameter measures 8 1/4¬ (20 cm). 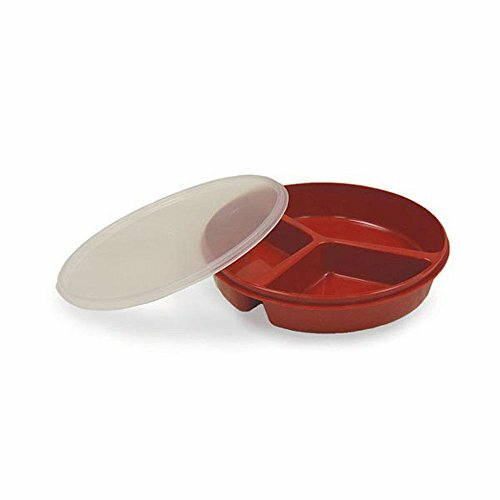 Dish and lid dishwasher and microwave safe. Three compartments, each about 1 1/2¬ (3.81 cm) deep, keep food separated.